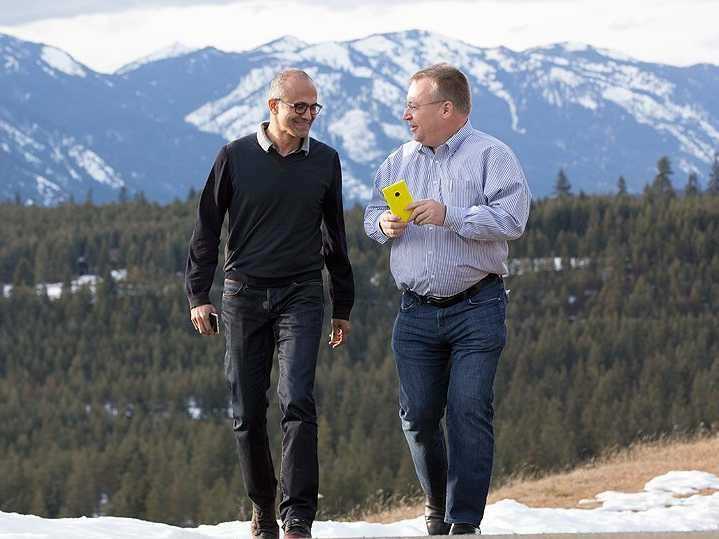 MicrosoftMicrosoft CEO Satya Nadella with Stephen Elop, the former Nokia CEO. Microsoft has officially killed the Nokia branding on its smartphones. On Monday, the company announced the Lumia 535, which is in the same family of phones as other Nokia phones that have been around since before Microsoft closed its $US7.2 billion purchase of Nokia this year. But instead of carrying the Nokia branding, the Lumia 535 is labelled as a Microsoft device, just like other Microsoft hardware such as the Surface or Xbox. It’s the first Lumia phone without the Nokia name. When Microsoft bought Nokia, many speculated this would eventually happen. It looks like those folks were right. Nokia is still going through a big transition as Microsoft absorbs it. Microsoft is in the process of eliminating 18,000 employees, its largest round of layoffs in company history. Most of those layoffs come from the Nokia division. Meanwhile, Stephen Elop, the former Nokia CEO, is now the executive vice president of Microsoft’s devices group, meaning he oversees all consumer hardware from Lumia phones to Surface tablets.